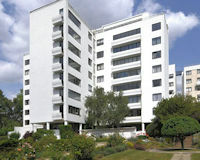 Description: This stunning block of flats was designed was by the Russian-born architect Berthold Lubetkin, on one of the highest points in London. It was built in 1935 for the entrepreneur Sigmund Gestetner, but he never moved in. Legendary architect Corbusier visited in 1935 and said, This beautiful building .... at Highgate is an achievement of the first rank. In 1934, Ern and Ursula Goldfinger moved into a flat in Highpoint I and at one of their parties the English-born Mexican artist Leonora Carrington fell in love with German artist Max Ernst at a dinner here in 1937. The artists bonded and returned together to Paris, where Ernst promptly separated from his wife. The following year they settled in Saint Martin d'Ardche in southern France.